This new Thinker's Guide was created specifically for the aspiring young learner, however the content and approach are applicable to students and people of all ages. This guide introduces critical thinking concepts and provides strategies for developing one's own critical thinking process. Its full-color images and glossy format help capture the attention of the teenage or pre-teen student while focusing on the essence of critical thinking as it applies to today's world. The skills implicit in this guide apply to all subjects. Teachers can use it to design instruction, assignments, and tests in any subject. Students can use it to improve their learning in any content area. Humans live in a world of thoughts. We accept some thoughts as true. We reject others as false. But the thoughts we perceive as true are sometimes false, unsound, or misleading. And the thoughts we perceive as false and trivial are sometimes true and significant. The mind doesn’t naturally grasp the truth. We don’t naturally see things as they are. We don’t automatically sense what is reasonable and what unreasonable. Our thought is often biased by our agendas, interests, and values. We typically see things as we want to. We twist reality to fit our preconceived ideas. Distorting reality is common in human life. It is a phenomenon to which we all, at times, unfortunately fall prey. We need a systematic way to further sound thinking and limit unsound thinking. We need to take command of our minds in order to determine in a reasonable way what thinking to accept and what to reject. Critical thinking is that process, that orientation, and in the finest cases, that way of living. 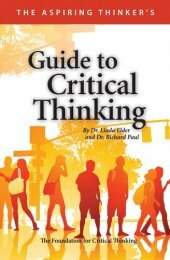 This guide focuses on the essence of critical thinking concepts. For teachers it provides a shared concept of critical thinking. For students it introduces critical thinking and provides strategies for developing one’s own critical thinking. Teachers can use it to design instruction, assignments, and tests in any subject. Students can use it to improve their learning in any content area. The skills implicit in this guide apply to all subjects. For example, critical thinkers are clear as to the purpose at hand and the question at issue. They question information, conclusions, and points of view. They strive to be clear, accurate, precise, and relevant. They seek to think beneath the surface, to be logical, and fair. They apply these skills to their reading and writing as well as to their speaking and listening. They apply them in all subjects and throughout life.